Los Angeles, CA. (THECOUNT) — A GoFundMe has been started for Kerry Lathan, the man shot along with rapper Nipsey Hussle outside a Los Angeles clothing store. At last check the GoFundMe had reached the $8,500 mark. Lathan was arrested upon his release from a hospital after officials say he violated his parole by associating with a known felon. That felon was Hussle, who died in the shooting. On March 31, 2019 an unfortunate situation took place that caused us to lose a valued mogul in our community. 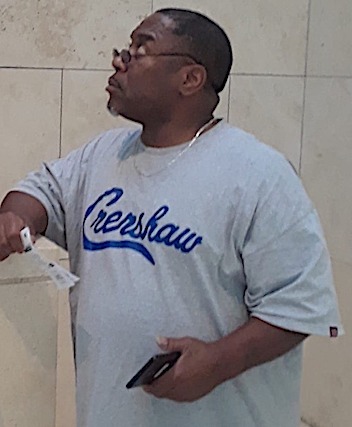 To add extra pain to this already heart breaking time we have now become aware that Kerry Lathan (age 56) aka “Cousin Kerry” has had his parole violated after being shot and wheelchair bound during the tragic murder of Nipsey Hussle. Cousin Kerry has been home from a 25 year prison stay for only 7 months and was stopping by The Marathon Clothing store to purchase a shirt to go visit a friend who had just lost their father. When the gun fire began Cousin Kerry was shot in the back and taken to the hospital. He was arrested and charged with violating his parole by associating with Nipsey a “gang member”. Cousin Kerry could now face 10 years to life for said “violation”. Urban outlet VladTV exclusively spoke to Lathan who first noted that he had just been sprung from prison after serving a 26 year-to-life sentence when he was rearrested following his release from a hospital. During the interview, Lathan expressed frustration at why he was placed in jail in the first place and noted that he was put back into prison for coming in contact with a gang member (Nipsey Hussle). Lathan also spoke on his condition in jail and broke down his original conviction, saying he only served 24 years. Reports say, Lathan traveled to the Marathon store after being invited by Hussle to get a fresh start, code for get some free clothing swag. T-shirts were priced at over $100 inside the popular street clothing store run by the late rapper. VladTV say Lathan detailed the moment he came in contact with Nipsey in the parking lot of the Marathon Store and described how Nipsey, himself, and his nephew were shot. Lathan pointed out that Nipsey looked out for him when he came home, despite them only meeting a few times prior. Check out Kerry Lathan’s GoFundMe here.